Best deal of the year! 70% OFF to buy 10 resumes + 5 invoices + 5 PowerPoint + 3 calendars with professional design! Each template in the pack is elaborately selected. PowerPoint templates save your time and efforts and help you do complete a awesome report in a short time. Resume templates help you get more interviews and land your dream job. 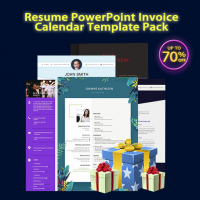 Invoice templates make your business more professional. Insert your pictures into calendar 2019 and record your good moments.